Put another shrimp in the soup! I knew last night when I went to bed that my second day fast this week was going to be a tough one. I’m not sure if it is mentally because I already had that mind-set that way, well what I do know was that it has been a challenge today! I started out this morning with a rocking spinning class and even though my legs were very sore and tired from yesterdays workout I killed it today. I was really focusing on the strokes, the power, the time and calories burned, that way I can really give it all! Anyhow, the soup turned out to be another perfect recipe that goes hand in hand with the 5:2 diet and has less than 500 calories! Fry the garlic and onion together (no oil or butter) and mix water, tomatoes, bouillon, salsa, lentils and bring to a boil for 5 minutes. Use a mixer to make the soup smooth add the sour cream and the noodles and re heart. 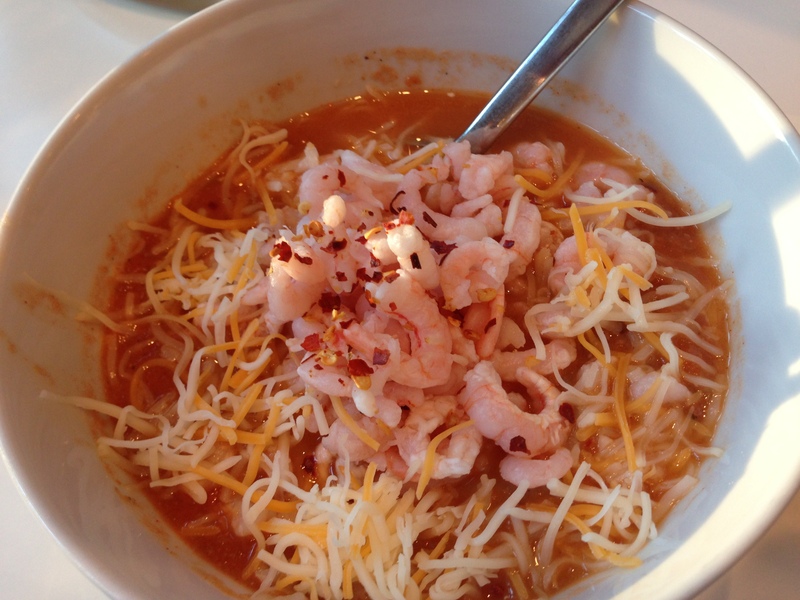 Add the shrimps and the cheese, sprinkle on some Chili Flakes and enjoy! This entry was posted in 5:2 recipes, Recipes and tagged 5:2 diet, cardio, fitness, gluten free, healthy-living, low-carb, motivation, recipe, soup, weight loss by Malin. Bookmark the permalink.